Campaign Goal, $1 Million Dollars for 1981! 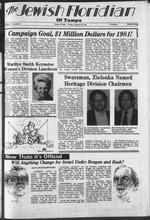 Swarzman and Dr. Carl Zielonka. to head the Telethon Campaign. charge of the Telethon Division. Tampa Jewish Federation^ Tampa Jewish Federation'/. Will Anything Change for Israel Under Reagan and Bush? given to the children in the JCC Pre-School. gives each day to our children." a.m. at the Admiral Benbow Inn. Tannen. The luncheon is $6.00. Participating in one or both. Jean (the former Jean Kessler of Tampa) and their son, Jimmy. isits to the different groups. iliary 506 in Port Richey. auxiliary in the past month. munity to visit the classrooms. open after 5 p.m. or on weekends. for tickets in Tampa is 877-7380.
present a 45-minute Magic Show. that the JCC Pre-School Needs. JCC Office or at the door. advance, $3.25 at the door. state, we wish them every success. "The Inalienable Rights of the Palestinian People." them by the Assembly itself." honour the PLO or any other organized group." stage productions being presented in South Florida. that all those prophets of gloom simply are wrong. such productions in the future. culture, and even to their renewed vigor. as we exercise the old mama loshen. (Annual-S3.SO) Out of Town Upon Raquast. the course of Israel's history. which world opinion treats Mr.
little to speak of as quid pro quo. his adoration of Adolf Hitler. dinavia to accept it because Mr.
clearly it belonged only to Sadat? For all these reasons, Mr.
what changes to expect in U.S.
first will continue to be the U.S.
value in the Middle East? of morality makes it blind to th. opposed to the Jordanian option. pears to be too "risky" to him. rifice looms larger than ever. throughout the world, Edgar L.
|almost $7.5 million over 1979.
simply to meet daily expenses." Ion "Life. Death and Transition,"
|that they have "no other course"
Itin West Hank and Gaza Strip. not lead to a Palestinian state. ii.. i OKI I "
qfOl*P A, ,hc RoUienbcrg Tdmily of Hotels. Daniel Tower sonesta Motel m Hernia. Tickets at the gate will be $10. prestige among his peer group,"
for the past 20 or 30 years." Dr.
gelicals' position on this issue. happy moment. We are very proud of Judge Morris, too! very proud of this marvelous honor, Sharon and rightfully so. Our love and congratulations to you, also. Carrera, Protestant; Mis. Loella Mootjoy, Baptist; and Mrs.
the eleventh time! On Jan. 6, their son and daughter-in-law. our beat wishes to your son and daughter-in-law. miss their Tampa friends. We miss y'all too. National Board of Women's Division, United Jewish Appeal. beaaflt both the Jews of Tampa and Jews worldwide. Israeli food. Then this weekend, the 23rd through the 25th. group members from Sarasota, Clearwater, and Bradenton. exhausted just writing about them! congregation i'l the Sabbath service. the University of South Florida and at the VA Hospital. Tampa. Bev, Mike, Lisa, and Adrienne! involved in the political process. ceremony at the Elysee Palace. lodges. A former minister in Gen.
jn't accept if anyone had. at ion in Chicago again." t cure it by strong words. \e some catching up to do." haven't caught up with it." businesses that trade with Israel. except those who are charged." the son of an old friend in Omaha. "acute dangers" to world peace. TEL AVIV (JTA) Joseph Mengele, who was the heads of the prison. penments on camp inmates, is now worHnr f- ,KoT'merman wrote. service of the Uruguayan army. authorities or to commit suicide. the Rio dispatch was Pisma. inctive past! Not to mention,. is rl 8 talk of the town! >how Groups nightly in the! resident Gail Kaplan said here. injunction to ban the Nazi rally. forts' to ban the Nazi rally." them fatally, by white attackers. to represent him in court. but believes that he S? The Dead Sea" Friday, Jan. 30.
at 7 p.m., and repeat ing Tuesday. Feb. 3. at 10 a.m.
, Haig was asked by Sen. I as a strategic asset?" 1 state and public order." court which convicted him anew. Tisch, JCRC president, and Dr.
here. I just can't find them." Israel, are announced by HIAS. of eight to ten days as heretofore. who insists on going to the U.S.
will be assited by HIAS. choices than in the recent past." never been permitted to enjoy." to the U.S. in this manner,"
New York N Y 1001'. Program at the school, as Prof. Haim Ben Shahar (left), president of TA U, looks on. Soviet Nuclear Weapons Still in Egypt? warheads, suspected of being nuclear, for the! domestic tranquility in this country." the disintegration of American society." by AJC's Houston Chapter on Feb. 4 and 5. Samet, AJC's director of Domestic Affairs. sorbed into the mainstream of American society. mission on Law and Social Action. Machinists, Local Lodge No. 962.
" by the American Jewish Committee. for three day* a* retreat in Scottedale. Jewish Immigrant," Abraham J. Karp uses con! already settled in the U. S.
ourselves with that half-civilized orthodoxy. .
Retirement of Gaynor I. Jacobean, executive! Society, is being announced by the organization. Gaynor's retirement will take place effective Jan.
s consultant. Prior to his association with HIAS. TV, Channel 8 7:30 a.m. Anne Thai, Executive Director. spectives on the Status of American Families." Tampa Jewish Social Service Executive Board 6 p.m.
gation Kol Ami's Men's Club 7 p.m.
Tampa Community Players 8 p.m. Movie: "The Israeli!" 962-6338/9 Rabbi Leonard Rosenthol Rabbi's Study, 12101N. a.m. Daily: Minyon, 7:15 a.m.
Yokov Werde Services: Friday, 730 p.m.-Saturday, 10 o.rn. Services: Friday, 6:30 p.m. followed by Shabbot dinner ot"
a sign that you must act. the housebound and the elderly. popping in for a visit and a chat. body is, ask your children. High School Gym at 3:30 p.m.
El/11? *' MWery of Mm Jtwim Harrtae*." eSitse fey P. w*iimai. 'two of my other children. 1980 and accurately reflect U.S.
most of the Carter term. Strip and the Golan Heights. upon Israel to allow two West! Council passed the same day. that look to Jerusalem as holy." harmful to it should stop. the U.S. delegation was silent. on Americans to denounce Israel. contained two attacks on Israel. ceived the U.S. at Camp David. said "only through open U.S.
Council Resolutions 242 or 338.
quietly the Camp David in. be leaned on to give more. toward the West Bank and! in a way that focuses attention! fiscal 1980 that ended Sept .
with SI.9 billion in 1977.
reached $2.4 billion 15 tun-"
catch up on payments o!